Need a World-class wireless noise cancelling headphone, but have limited budget? Try CQ7 Headphones. Enjoy the same Noise Cancellation and even better Audio Performance, but SAVE YOU 300 BUCKS. Wanna free yourself from airplane roar or city traffic noise? Wanna focus on your jobs or take a nap in a noisy office? Turn your CQ7 on, the World will be off! Affordable price but top performance, 18 month Warranty and easy to reach customer service! OUTSTANDING NOISE REDUCTION & EXCELLENT AUDIO: Still forced to pay $300+ for a top Wireless ANC Headphone? Now, CONAMBO helps you SAY NO loudly. 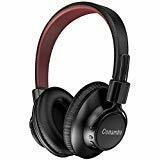 Try CQ7 Headphones, enjoy the same Noise Cancelling and even better Audio Performance, but SAVE YOU 300 BUCKS. WIRELESS AND WIRED PLAYBACK: Wire or wireless, noise cancelling or without noise cancelling, Music or Calls, all under your controls! Up to 20 hours battery time in wireless/ANC mode and up to 50 hours in ANC only mode. SUPER LIGHT AND EXTREME COMFORT: Weighs only 6.35oz(180g), Well-built Headphones with Lightweight yet premium materials, much lighter than most over ear headphones on market. Foldable over-ear earcups, fully adjustable headband and professional memory-protein ear pads (easy replaced), ensure a perfect fit around ears and all-day long wearing. QUICK CONTROL OVER MUSIC & CALL: You can adjust the volume, change the track, play and pause the music via the headphones. Built-in microphone (diable in wireless mode) offers hands-free calling convenience. WIDE COMPATIBILITY & 18 MONTH WARRANTY: Bluetooth 4.0 CSR 8635 chipset built in and detachable 3.5mm audio cable, ideal for use WIRE or WIRELESS with iPhone iPad smartphones, laptops, tablets, computers...etc., and airplane adapter including for in-flight entertainment systems. If you have any questions about this product by Conambo, contact us by completing and submitting the form below. If you are looking for a specif part number, please include it with your message.